Hello guys! Sorry for the lack of posts this past month but my holidays were calling and I’ve litterally just been relaxing in the sun. I can’t believe that August is almost gone already! Where did the summer go? When i finished my exams back in july, I remember thinking ‘yes I’ll finally have the time to write as many blog posts as I want, take as many pictures as I want and bake as much as I want’. Unfortunatly, as the summer kicked in, the only thing that I wanted to do was go out, have fun with my friends and enjoy the beautiful sunny days. Oh well, can you blame me? But now I’m back with another cake! Are you surprised? (I don’t think so XD). Yesterday, August 23, was my boyfriend’s birthday. So of course I had to make a cake to celebrate his big day. Since he is absolutely obsessed with white chocolate, I figured I had to make a cake that would taste perfectly with my amazing white chocolate ganache. What did she end up making you guess? Linda Lomelino’s Carrot Cake of course! If you guys follow my blog, you know that if I have to make a cake i’ll always look it up on Linda’s blog. She is amazing and I don’t think I’ll ever stop praising her. Linda’s recipe was made with a cream cheese frosting but, since I don’t really like Cheese, I’ve decided to replace the Cream Cheese with my white chocolate ganache. Let me tell you that that was a pretty damn good decision. The Carrot Cake goes absolutely heavenly with the white chocolate. Perfect combo right there! If you have never made a carrot cake, I know that it can sound a little scary. I personally am not a very big fan of carrots but with this recipe I promise you you won’t even taste them. When I told my guests that the cake was made with carrots they couldn’t belive me! I tastes like wallnuts and cinnamon which, if you ask me, it’s absolutely amazing. The Carrots make this cake super soft and spongy, In fact you don’t need any syrup to pour on the layers. But now let’s get to the recipe! Heat the oven to 180 C°. Butter and flour a 23 cm cake pan. Melt the butter and leave to cool. In a bowl, beat the eggs and sugars until fluffy and lighter in color. Add the butter and vanilla and beat until combined. Mix flour, baking powder, baking soda and cinnamon in a bowl, then sift into the batter. Stir until just smooth. Add grated carrot, wallnuts and olive oil and stir until combined. Pour the batter in the prepared pan. Bake for about 1hour and 10 minutes, or until a cake tester comes out clean. Leave to cool for 20 minutes, then turn out onto a wire rack to cool completely. Chop the white chocolate in a bowl and place it over some hot water. When the chocolate is starting to melt, add the heavy cream and stir until completely melted. Let it cool for 10 minutes. Cover with cling film and place it in the fridge over night. Take the ganache out of the fridge and beat with a mixer until nice and fluffy. Cut the cake into three layers. Place one layer on a cake stand and spread a thin layer of ganache over the cake. Repeat with each layer. 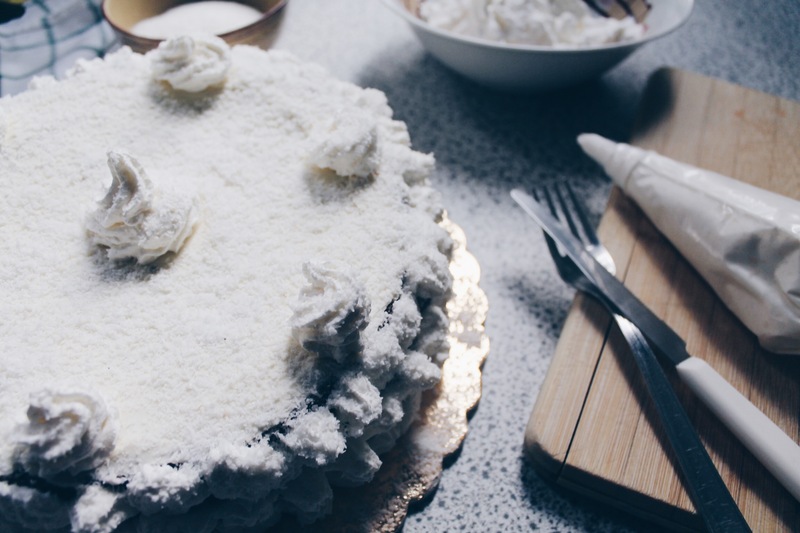 Spread a layer of ganache on the top of the cake and sprinkle with grated coconut. Whip some heavy cream and with the help of a piping bag cover the rest of your cake. I hope you guys will try to make this amazing cake! Let me know in the comments if you did. Tweet me or send me a pic on instagram with the hashtag #TheHotMessBlogCakes!